Phoenix (pronounced /ˈfiːnɪks/) is a small and not-so-bright constellation in the southern sky. It is one of the birds in a "nest" of bird constellations near it. 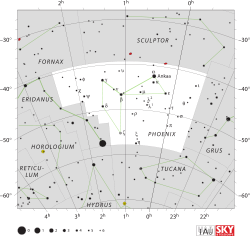 This constellation was named after the mythical phoenix. Wikimedia Commons has media related to Phoenix (constellation). This page was last changed on 24 August 2014, at 00:01.